Discovery’s DENbrarians are getting their YA “book on” every month! Wanna join us? We’re looking for Media Specialists who would like to select the book for DENbrarian! Click here if you’d like to take over for a month! Long ago, in a galaxy far, far away, a day was established to celebrate reading and all things Star Wars …That Day is today October 5th. 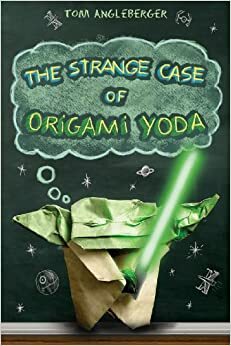 If you believe the Force is a part of your everyday life then you will relate to Dwight and his adventures in middle school when you read The Strange Case of the Origami Yoda. The iREAD club at Sherwood Middle School in Baton Rouge, Louisiana voted for the October book and Tom Angleberger’s book was the big winner. They love how the book is printed on pages that look crumpled with cartoon sketches, supposed hand writing, and various fonts. The best part of the book can be found at the end….instructions on how to make your very own oracle of wisdom- The Origami Yoda Finger Puppet! The Sherwood Middle iRead club will be celebrating Star Wars Reads Day this month with a galactic party. They will be making their own mini Yodas and enjoying treats such as Yoda Soda. Check back later this month to this post for pictures of the event. So get your DENbrarian book, grab your light saber, and may the Force be with you! As Yoda would say…The END This Is? To Learn like a Jedi you must PIN! Our Pinterest pinboard for this book is ready. Sign up to be a DENbrarian and you’ll be added soon as a “Pinner” ASAP! Click here if you’d like to participate in gathering and sharing resources related to each month’s book selection, or follow our main DENbrarian Pinterest Board which will contain archives of each month’s materials. Welcome to our book club- EVERYONE is invited! You do NOT have to be a Library Media Specialist to join this group– …you just have to love great Young Adult books! We began in April with The One and Only Ivan, then we read Wonder in May. June brought The Apothecary, July was The 5th Wave, August led us to The Fault in our Stars and now The Strange Case of Origami Yoda. All books selected will be in the upper elementary to middle grades range and our group will soon move to to online connections, Skyped author visits, virtual discussions, resource sharing, a student project showcase, and hangouts starting soon. This is a great series and my students love to try to fold paper into a Yoda.